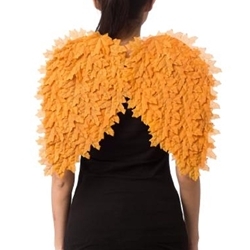 The Autumn Fairy Leaf Wings are a pair of orange leaf fantasy wings. The layered leaves bring to mind the thought of a colorful fall tree. The Autumn Fairy is said to bring about the change of the seasons by turning the leaves from green into a multitude of colors. With the Autumn Fairy Wings, you can achieve a beautiful, seasonally fitting costume this Halloween. Pair with Autumn Fairy Leaf Eye Mask and Elf Ears to complete your fairy look.